Set in picturesque Polperro, this delightful listed fisherman's cottage offers the chance to experience life in a Cornish fishing village, where the narrow streets deter cars, and every corner is an artists' dream. 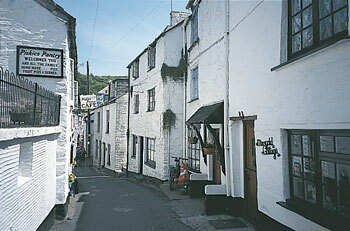 Dating from the 1740's and tastefully refurbished, it offers comfortable accommodation on the first and second floors (centre of left photograph). 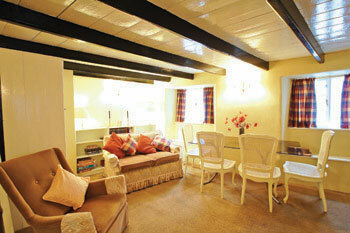 It is just 2 minutes walk from Polperro's amenities, including boat trips, inns and restaurants. Good walking, riding and sightseeing in the area. Two bedrooms. Stone steps to entrance on first floor: Comfortable beamed sitting/dining room with sofa bed (for + 1). Fitted kitchen. Second floor: Double bedroom. Bunk bedded room with 2' 6“ beds. Bathroom/W.C. with separate shower cubicle.